For crust: In a food processor, pulse almond flour and 2 tablespoons xylitol to combine, about 10 seconds. Add butter and pulse until mixture resembles a coarse meal, about 30 seconds. Add 3 ounces labneh/cottage cheese and the sour cream and pulse until the dough starts to come together, about 30 more seconds. Put dough on the bottom and up the sides of an ungreased 10 tart pan. Prick dough about 15 times with a fork and chill in freezer while preparing filling. For filling: In a small bowl, toss pear slices with 1 tablespoon of the xylitol, brandy, 1/4 teaspoon of the almond extract and ginger until evenly distributed. Set aside. In a large bowl with an electric mixer on high speed, beat 8 ounces labneh/cottage cheese at room temperature and 1/3 cup xylitol until soft and creamy, about 3 minutes. Add egg and remaining 1/4 teaspoon almond extract; beat until smooth, 1 minute more (scrape down sides of bowl as necessary). Pour labneh/cottage cheese mixture into chilled tart shell. Arrange pears on top of labneh/cottage cheese mixture in slightly overlapping concentric circles. If there is liquid left from the pears, pour it evenly over the tart. Bake for 30 minutes. Remove from oven and place on a wire rack to cool. Melt jam with water over medium heat. Brush over hot tart and sprinkle with almonds. 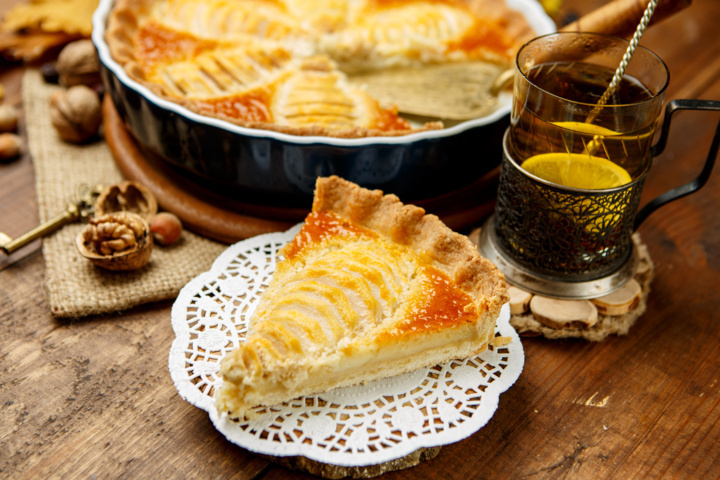 Let tart cool completely before serving. Why does this recipe include ingredients that are not SANE? This recipe contains pears, which fall into the ‘other fruits’ category on the SANE spectrum. This means they are neither SANE nor inSANE, and can be enjoyed in small quantities – these are just not items that we go out of our way to consume. i.e. : SANE does not encourage eating 10+ servings of pears per day. The purpose of recipes such as this one is to be delicious and prevent deprivation, which can be helpful in preventing us from turning to truly inSANE items. A small portion of pears accompanied with whole food fats will not derail any hormonal healing efforts. If you want to make a SANEr version of this recipe, try experimenting with swapping the pears for a low fructose fruit, or combination of low fructose fruits. Some examples include peaches, strawberry & rhubarb. At SANE we advocate Progress Not Perfection. The small amount of sucralose in the apricot preserves is not significant enough to hinder hormonal healing. If there are any reservations about the apricot preserves used in this recipe, experiment with making a sugar free preserve such as this one. If brandy is not available, cognac can be substituted. If alcohol cannot be consumed, swap for 1 tablespoon of water.